Words from March 17: Today was a little girl home from school and pink eye and cancelled meetings and cuddles and movies and working in tiny slivers of time and a very sweet pediatrician and bangs that made me happy and cherry tree blooms moving on to unfurling green and chocolate chip cookies and taxes and paperwork and several "holy cats!" moments of adulting and more complaining than I'd like to do and a list of joy made in my head and a list of real made right here while I tried not to burn the hamburgers on this gorgeous night where the light is luminous and I'm feeling gratitude for the inbetween moments that bring me back home. Sometimes you have to snap a photo and pair it with pieces of the true stories that make up a day. Use the prompt "today" and just start writing down every word. There is so much beauty in telling the true, real stories. Over here I'm in that space of climbing a somewhat steep learning curve with a few aspects of my business while trying to find a rhythm now that Jon and Ellie are back to school while also processing the news we received earlier this month that we don't have a lot of time left with our sweet golden Millie. And, you know, just being human in the midst of it all. Diving into these topics isn't actually what I want to talk about today (that will come); rather, I want to talk about one huge self-care move I'm making that's helping me right now. And that self-care move? Laughter. If you've been around here a while, you know I'm a bit obsessed with lip syncing. As in there was that one time I recorded myself lip syncing "Jolene" by Dolly Parton and put the video up on the internet. As in having lip sync parties is something we do at my retreats now. For real. As in watching videos of Jimmy Fallon and guests lip syncing delight me to the tips of my toes. And last week, while I was navigating this stuff over here, a dear frind texted me the link to Ellen Degeneres and Jimmy Fallon's lip sync battle first thing in the morning. After I finished up a few phone calls, I pressed play and in a few moments, I noticed that I was smiling so big my cheeks were starting to hurt. When it was over, it was like I'd relaxed into myself again. I felt a lightness inside and around me. And laughter and connection and joy were the cause. So I settled in for more. And over the last week I've been taking a little time each day to get my laugh on. I watched clips from Stephen Colbert's new show. I rewatched Amy Schumer doing just about anything. I watched Stevie Wonder sing (and maybe teared up while laughing). And each day, for just a little while at least, I was grounded in the awesome that is deep, real laughter. Sometimes when you're standing on an edge in your life, when you're deep in the learning or even in the grief, it helps to invite in laughter to remind yourself that the light is always there. Maybe call up that friend who always has the best stories to tell. Or ask your dad to tell you that one story that makes you laugh every time. Or invite that friend for coffee who is the person you can be your most ridiculous self with. Or spend your lunch break, like I've been doing lately, with Jerry Seinfeld or Stephen Colbert or Amy Schumer. Laughter can bring you back to center honey. Choosing to laugh isn't about not acknowledging the tough stuff. No. It's about inviting in the light so the tough stuff doesn't feel so lonely. It's about standing with others on the common ground that laughter gives us. What I find again and again is that comedians are the truth tellers of our time. They have their finger on the pulse of the absurd, of the challenging, and even of the truth of grief. I actually think that there's a real chance you'll feel deeply seen in the midst of whatever you find yourself experiencing when you take a few moments to spend some time with a comedian or two. 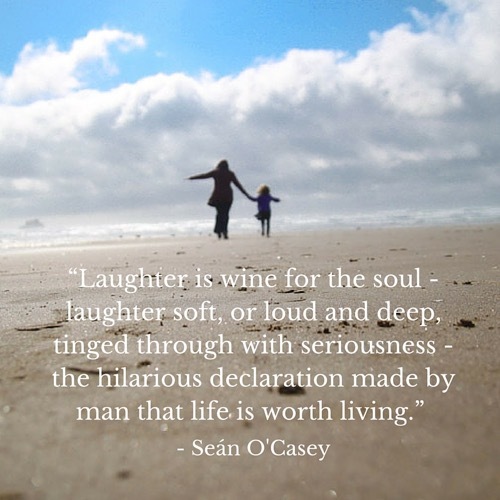 An invitation: Now tell me, what makes you laugh in your corner of the world? An author, a show, a person in your life? I'd love to know. Please share in the comments. There are so many stories inside me about the photos I don't have. Of course, this wishing hasn't meant that I haven't been present to the beauty of the everyday moments. Noticing the everyday beauty is "my jam" as they say. But you can be present to that beauty and still wish sometimes. I wanted a photo that captured how it felt to be her mama. A photo that captured the joy that is there even if only at the edges some days. A photo that said, "Amidst it all, she feels this joy, this love." A photo that said, "You're doing a good job Mama. You really are." A photo that captured both of us - the magic, the silliness, the softness, the connection. A photo that would gently push me to shed another layer of how I wish that first year could have been for her, for us. And honestly, a photo that did all that while capturing me in a way that wouldn't distract me from the story. I wanted to feel beautiful in that photo. Of course I could tell the story with my words and with my camera and I have again and again. And that piece is so important. Self-healing, as my friend Pam says, is an important piece of unpacking the stories and feeling seen by one's self, which is vital in my opinion. But still, I felt that ache of wanting to be seen by someone who would deeply get it. I wanted to hold that evidence in my hands so I simply couldn't deny it. And then on a day in June, Tara Whitney arrived, and Ellie took her hand within minutes and said, "Come and see my room." And a little girl's laughter and a photographer's wisdom and kindness created space for me to relax into myself, to relax into that joy and love. And before I even saw the photos, that little wish that was more like a crack in my heart stitched right up. There are so many gorgeous photos from this day that I'll be sharing, including one of me and Jon that has me saying, "Yes, this is exactly how I feel" even when that feeling can feel far away from time to time after this many years together. And several of all three of us that make my heart burst with joy. But this photo. This one. I had to show you because I'm so grateful for the ways you've held my story these past few years and I knew you would get it. Bonnie snapped this photo last week of a corner of my desk in the studio, and it just sums up the mantra I need right now. Today, I'm alone here at home for a few hours, and all I want to do is just sit in the quiet and be still for a while. No work. No people. No social media. No business strategies. Just quiet. Just me. My list of posts I want to write and things I need to do is long. And I'm excited about so much on that list. But there is also the piece of needing rest. Of needing space. Of needing to let it be simple. And I don't mean suddenly deciding to declutter or try a capsule wardrobe or make a big change that actually isn't simple at all (for me) but seems like it should be, which is a move I often make when these feelings arrive. I mean listening even more closely to the deep desires within me and moving from there. Letting it be simple by continuing to shed the shoulds and the "who do you think you are" stories that try to crowd back inside my brain and heart even when I think I released them long ago. Letting it be simple by opening up and sharing more of the stories here even if it's hard to know if anyone is actually reading them because we're so focused on scrolling and likes and social media strategies these days. Letting it be simple by recognizing that I'm only one person but that I can ask for help. Letting it be simple by saying no. Letting it be simple by saying the deep, true "Yes" when it calls to me. Letting it be simple by showing up and letting the words just come out onto the page even if they're clunky. Letting it be simple by just being me. That doesn't mean it is easy. It means that so often we look for the answers outside ourselves when we simply, truly, need to step back and find that quiet and simply look within. So I'm off to sit in the quiet for a bit this morning before diving back into the juiciness this afternoon. When your soul is saying you need to be alone in the quiet, I've learned that you should listen honey. Because that's the kind of should that isn't a should at all but is instead your own wisdom guiding you. This is a post from deep into my archives. After almost 10 years of blogging, I'm revisiting some of the posts that still hold deep meaning for me in the hopes that you will connect with them too. After years of working to recognize the pattern I talk about in this piece, I'm pretty good at quickly seeing when it tries to present itself again. But this is one of those patterns that I think others experience, especially as we spend so much time online. If you recognize yourself, I hope you will try to open yourself up more instead of putting on armor to protect yourself. Again and again I've learned that it is only when I truly show up as me, in all the messiness that can entail, do I really find the people who deeply see me. This is one of the reasons I host retreats: To create a safe environment for women to practice showing up as themselves and seeing what it's like to make friends from that place. I've been thinking a lot about how I really know how to get lost inside my own head, and how sometimes that means getting lost inside the past. The truth is that the past is what gives us the experiences we need to deal with the moment we are living in, but sometimes the past creates a path where you are walking knee deep in murky stuff that isn't helping you at all but is instead threatening to pull you under. A pattern has begun to make itself clear. I try very hard to feel alone in a group. I try to find a reason why someone won't like me or why I'm being invited to feel left out or why I'm not the most interesting person there so of course people really do not want me to be part of it all and oh how the list goes on. I try to find little reasons to feel lonely, even when I'm having a good time. And here is the thing, i don't even really realize I'm doing it because I'm so wrapped up in telling myself, "See, see, I'm right. They don't even want to listen to you/your ideas..." or some other such nonsensical phrasing that I try to make myself believe. Somehow this must have been working for me in the past. This walking in the back of the group "Oh look at me, no one even wants to walk with me" kind of crap...it must have been working. I think it is how I could justify feeling lonely so often. And I suppose the reality is that I've had some experiences where this little voice has been proven right. Where someone seemed like a friend but wasn't. Where a group acted like they wanted me to be part of their closeness but when I was really myself, I was rejected. So when I found myself invited to a weekend with a dear friend I've spent a lot of time with in person and two bloggers I couldn't wait to meet in person and spend time with, I said yes. And I didn't even think about saying no. I guess I wasn't allowing myself to dwell on any negative possibilities because if I did, I might have a total panic attack thinking that the rejection I'd felt from other bloggers I'd spent time with might happen again. And I never did let that panic even whisper loud enough to warrant recognition. Still, I tried to feel alone in a group again. Even though I was having an incredible time. Even though I felt truly embraced. Even though I was staying in a home where I feel like family when I'm there. I still tried to let the past stomp on the present. But, this time, I tried to just observe it while it was happening. I recognized it, "Oh, there you are again. There you are trying to invite me to see something that isn't happening. I see you." And I just let myself feel it, while also staying really, really present in what was happening around me. And a funny thing happened. I couldn't convince myself that it was happening again because all the evidence pointed to an experience with three women where I was being really seen for all of me. Staying present while allowing myself to be honest with me about the emotions that were coming up allowed me to remain grounded while recognizing my own wisdom. And, there is this other piece of deciding not to share all those feelings as I was having them because even though I was surrounded by women who care about me, who would have listened, sometimes the sharing creates an unexpected drama that just isn't needed if you allow yourself to find that grounding within. I believe this one simple truth: We all want to be liked. But there is another layer of this: We need to like ourselves. I know that might sound simple or silly or "mid-80s new agey," but we need to look at the truth of our own self-reflection and be honest about what we say to ourselves and how that invites its own layer of confusion as we live in our lives. Or should i say, I'm doing this a bit more each day and realizing how it enables me to be so much more fully present in my life. I started this blog in the middle of the two-year yoga teacher training i did a few years ago. I was in the midst of understanding how just being with one's breath, present within the inhale and exhale, could change one's life. The idea of trying to "be present, be here." Learning to really live this, not just speak of it, is a pretty intense experience. But, I think it is really living. Living by being present and grounded and embraced within your own knowledge and truth...while allowing yourself to be loved. My hope for you is that you let yourself be loved. Self-portraits are part of my self-care; they're one way that I help myself feel deeply seen in the world. I've been taking them for 10 years now, before we lived in this time where people debated the merits of a "selfie" on CNN. If you follow me on Instagram, you see the ways I work things out through taking a photo of myself, usually with my arm extended. I look into my phone like it's a mirror and I capture the realness of the moment. From joy to silliness to exhaustion to confusion to hope. My Instagram selfies are like a tiny peek into the pages of a journal that one might hide beneath a mattress. Taking these photos and then reflecting on what I'm feeling and the ways I can hold beauty and grit at the same time become an exercise in seeking evidence of the ways I'm living my life with my heart open. And sharing the photos invites you into the conversation with me, either literally through a comment or in a quieter way where you perhaps reflect on the beauty and realness in your world. It's another way I try to remind us both that we're not alone in our corners of the world. I'm currently taking my friend Vivienne's Be Your Own Beloved ecourse. This is the second or third time I've been in the course, and each time I'm reminded of the power of other people's stories as I read Vivienne's words + see the self-portraits from other participants. 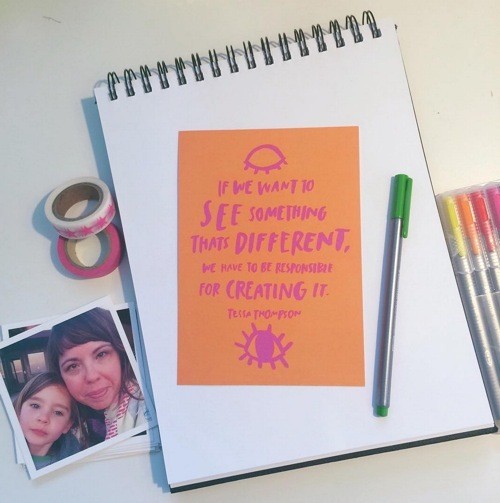 This weekend, she gave us a prompt about claiming space in our lives, in our photos. I read her words and felt deeply moved by the story she shared about her own relationship with claiming space. For a moment I thought about going outside to take a photo but then I let the to-do list pull on me. Later, when my daughter was napping, I remembered the prompt and pushed myself to stand outside and prop my phone up against the side of the grill on the backporch, set the timer, and take a few photos. After the first one, I realized I was getting this gorgeous flare from the sun lowering toward the horizon. Then when I saw this one, I heard one of my favorite phrases inside me: You are standing in your light honey. Looking at this photo, I felt powerful, open, determined, and even beautiful. One of the words that keeps crossing my path lately is "rise." And this photo felt like a moment of rising. Yes. Even though I take self-portraits in some form or another almost daily, I seldom take full body shots. I can list so many reasons, from not wanting to take the time to prop the camera and use the timer to not feeling up to it to feeling frumpy to not feeling like my photo will be interesting or unique enough to not wanting anyone to see the mess of my house or the overgrown weeds in the backyard. All reasons that take me far away from the woman who knows she can claim her space in her world. I'm so grateful to Vivienne for this prompt and for the ways she shares her stories so others can remember to make the choice to love themselves. Yes yes yes. 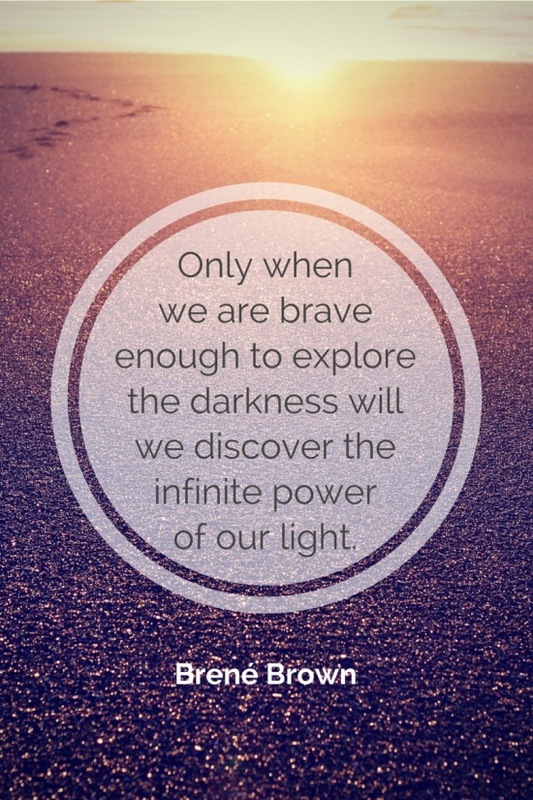 She has a wonderful on demand class called Be Your Own Light that I recommend you dive into. This self-portrait experience led me to Hand to Heart's March theme of Standing in Your Light. 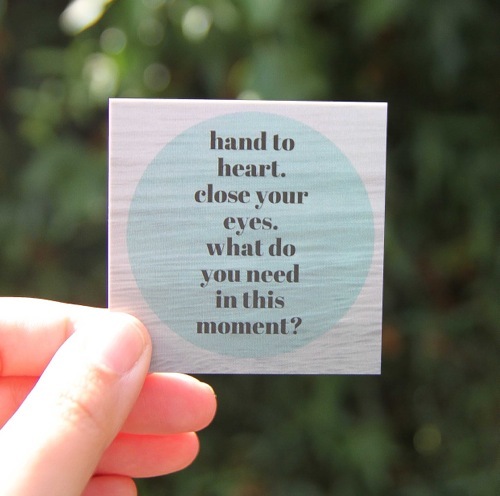 Hand to Heart is my free private Facebook group for women who want to be in conversation about self-care practices and how we can hold the beauty in one hand and grit in the other. Each month we explore a new theme to add to our current self-care practices, and this month, I'm sharing weekly stories about my own journey of learning to stand in my light. You can read more about the group and request to join right here.